Fresh oregano, thyme and basil highlight this brightly coloured salad that delivers garden freshness into a single dish. Add a few cups of cooked cannellini beans and serve atop greens for a light lunch. Preheat oven to 400 degrees F. Toss the tomatoes with 1 tablespoon (15mL) olive oil and garlic. Spread onto a baking sheet and sprinkle with dried basil, oregano and thyme. Roast in oven until the tomatoes are tender and start to shrink, about 40 minutes. Remove from oven and let come to room temperature. When the tomatoes finished cooling, toss the zucchini, squash and shallots with remaining 1 tablespoon olive oil. Add the fresh basil, oregano and thyme. 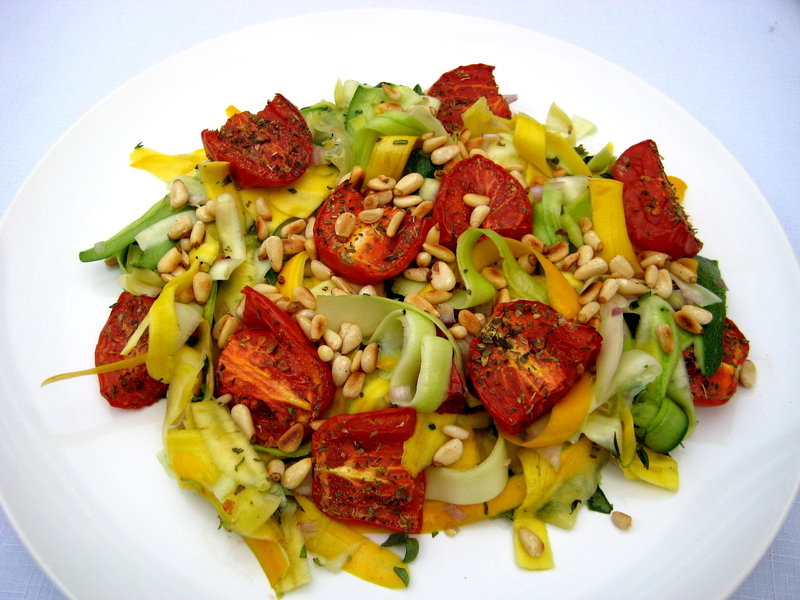 Toss with tomatoes and pine nuts, then season to taste. Serve at room temperature. *When peeling the zucchini, peel only the outer edges, until you get to the seeds. The middle of the zucchini and squash won’t peel well. Reserve for other uses. **To toast pine nuts, heat a dry skillet over medium-high heat. Add pine nuts, stirring frequently, until they start to brown and are fragrant, about 7 to 8 minutes. Remove from the heat and transfer to a small dish to cool. your pics are so good that it makes me want to eat EVERYTHING!!!!!!! !